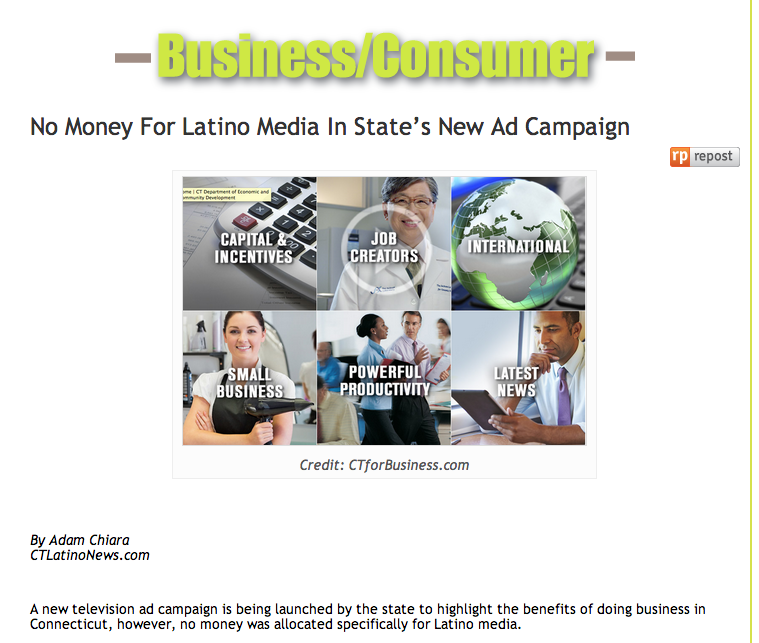 A new television ad campaign is being launched by the state to highlight the benefits of doing business in Connecticut, however, no money was allocated specifically for Latino media. Though the campaign will not air on any Hispanic TV programs or Spanish language channels, the DECD says the ads will still been seen by Latinos. “We did not specifically target any ethnic group,” said Jim Watson, spokesperson of the DECD. Watson notes though that based on the data provided by Nielsen, 7 percent of all of the impressions purchased will be delivered to Hispanics. “This translates into the media spend of $43 thousand against Hispanics,” he said.